Chelsea vs. Wigan Athletic : 9 February 2013. Another Saturday, another Chelsea home game. Except…this was a Chelsea game with a difference. After relinquishing my grip on the 240 game unbroken home run against Arsenal some three weeks ago, the game with Wigan Athletic now represented “Game One” of a new sequence. I don’t expect to go nine years this time, but let’s see how far I can get. Unfortunately, Lord Parky has been suffering with the ‘flu and so was unable to accompany me to Stamford Bridge on this occasion. I hoped that he would be “match fit” once again for the Brentford F.A. Cup replay. Before I say too much about the events of Saturday 9 February 2013, I feel that I need to share a solemn tale. On Monday, a former Frome Town player was killed in a road traffic accident and, although I did not know him personally, I remembered him from school days when he played in both the school and cricket teams. On Wednesday, I attended a Frome Town game with a few friends and there was a minute’s silence before the match in his memory. Ironically, on my drive out of the Frome area, I needed to top up with diesel at Beckington. It was here, coming home late from a mid-week Chelsea game before Christmas, that I last saw him. As I circumnavigated Warminster on the town by-pass, I drove past the crash site. There was blue and white police tape marking his car’s final resting place. There were bouquets of flowers propped against a fence. Why do I mention this story? I mention it to highlight the fragility of human life. On my travels around the highways and byways of England and Wales, I have had a couple of small-scale accidents. I have been lucky. But this was a deeply sobering incident which has played deeply on my mind over the past few days. The drive past the crash scene was a deeply moving moment. As I headed past Warminster and up on to Salisbury Plain, the solemnity inside my car was all too apparent. Outside, the weather was murky. As I climbed up onto the A303, snow started to fall. I wondered what sort of weather would be awaiting me once I arrived in London. Thankfully, by the time I had stopped at Fleet in Hampshire for a McBreakfast, the snow had stopped. I spotted a group of four Chelsea fans – unknown to me – at the services and I rolled my eyes to the sky when I saw their appearance. All four were rather rotund and all four were wearing tight-fitting Chelsea shirts – but crucially they were all wearing Chelsea shirts over various sweatshirts and the like. They were all in their mid-‘fifties – not a sin in itself of course, I’ll be there sooner rather than later – but I’ve always thought that tight-fitting football shirts look plain silly on people of a certain age. I could only imagine what conversation Parky and I might have had in the circumstances. I made great time and was parked up at 10.50am. I had plans to meet a few friends at the hotel at 11.30am, but had just enough time to pop in to “The Goose” which had recently been closed for refurbishment. Although I didn’t have time for a drink, I greeted a few friends who were already enjoying a few liveners. The place looked excellent, with new leather seats, floor tiles, carpets, wallpaper and fittings. There is even a TV out in the beer garden. As I headed down to The Bridge, I noted that The Malt House had opened-up again, too. No doubt there will be higher beer prices at each locale, but I guess that’s inevitable. Down at the hotel, there was a gathering of friends from near and far. My guest for the day – Constanza, born only a few miles away from The Bridge – was visiting London for a week from her home in Michigan. She was in town to attend a couple of interviews at colleges in order to get a place for a Master’s degree in the autumn. She had already done the stadium tour and museum earlier in the week, but this was her big day. 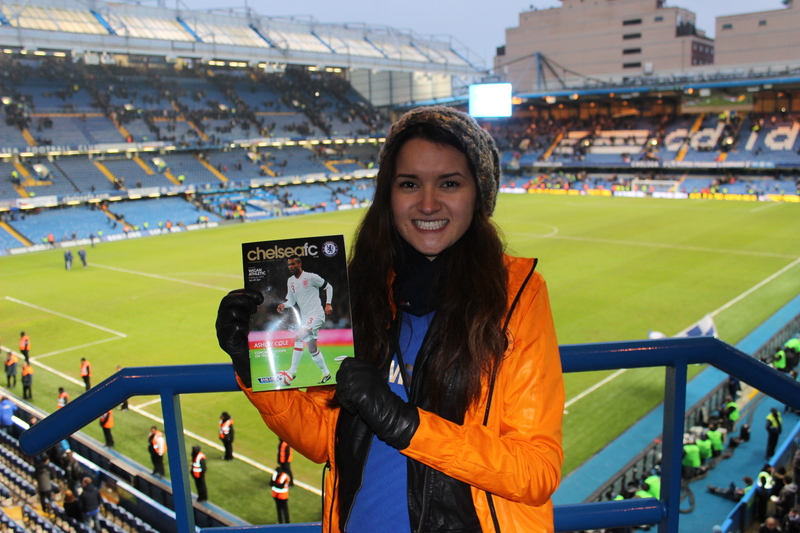 Her first ever Chelsea game. Without wasting much time, I quickly introduced her to Ron Harris and Peter Bonetti, who were sitting in their usual area. Cons’ smile was wide as she shook hands with both of these Chelsea legends. Mike from New York was over for the game – he got out of JFK just before the snow fell on Friday – and was chatting to father and son Jim Senior from NYC and Jim Junior, who now lives in Thailand. Gill and Graeme were also present and we soon posed for a photo with Gill’s “Kent Blues” flag. It is always a big thrill for me to meet first-time visitors to Stamford Bridge and to show them a few of the sights and share few stories. I’m a very lucky person. With no children of my own, I at least get the chance to play “father” to a few first-time visitors to Chelsea every season and it is something that I treasure. Thankfully, a “meet and greet” with Ron Harris is part of the usual routine now and I am very grateful for that too. Unfortunately for Cons, Ron Harris passed on the news that John Terry wouldn’t playing. His old knee injury had become enflamed again. JT is Cons’ personal favourite, so my heart went out to her. Cons and I then walked around Stamford Bridge as I explained a few of the sights. Outside the East Stand, we met up with Steve Mantle who was with another first-time visitor from the US; a member of the infamous “OC Blues” in California. So, Steve and I were doing our little bit for Anglo-American relations. How wonderful it is to see Stamford Bridge through fresh eyes. It’s easy to get a little disheartened at the ever-diminishing atmosphere and the increasingly disconnected support base at The Bridge, but we mustn’t lose sight of how intimate Stamford Bridge is, nestled amongst the bars and pubs of the Fulham Road. There is nothing like the re-match buzz on match days in deepest SW6. We continued our walk around The Bridge, stopping off for a photo-call at the Peter Osgood statue, before meeting up with Mike again down at the White Horse on Parson’s Green. There were reminiscences of Tokyo and also thoughts about the Asia tour in the summer. Once the tour dates for the games in Bangkok, Kuala Lumpur and Jakarta were announced on Thursday, I felt the adrenaline start to pulse through my body and within a few hours of checking and cross-checking flights on the internet, I had found some very agreeable prices. However, I explained to Mike that I have since thought hard about the tour and have “stepped back from the edge of the cliff.” I was ready to take the plunge, but I need time to look at all options. In truth, I am a little dismayed that Chelsea has again chosen games in Bangkok and Kuala Lumpur. These are a couple of fine cities, but it was only eighteen months ago that I visited them in 2011. I was hoping and praying for games in China – Shanghai and Beijing would have been perfect – but I am not sure about returning to BKK and KL so soon after my last visit. It seems that the Chelsea “problem” of getting drawn against teams from familiar cities – Barcelona, Prague, Porto, Rome, Milan, Valencia – in UEFA competitions is now being replicated in Asia. Another pal – Dave – arrived at around 2pm. He is from London but has been living in New York for seven years. I first met him out in California on the 2007 tour. He is now living back in England – and badly missing New York. He is especially missing the view from his apartment in Brooklyn, overlooking the East River, bridges and all. The view of a pub from his flat in Tufnell Park just doesn’t match up. Cons was enjoying the pre-match and there was talk of her getting a season ticket for 2013-2014 should her interviews be successful. It warmed me to hear her mention the phrase ‘my Chelsea family” on more than one occasion. Although I originally wanted to be inside the stadium at 2.30pm to allow Cons the sight of the players’ pre-match routine, I’m afraid that old habits meant that we reached our seats with only five minutes to spare. Wigan’s away following was unsurprisingly small. For the first time that I can remember, all 200 away fans were encamped in the lower tier, allowing an extra 1,000 Chelsea fans above them in the upper tier. I’ve long been advocating this; good to see. David Luiz partnered Frank Lampard at the base of our midfield five, which meant that Cahill partnered Ivanovic in the defence. I am – of course – not Benitez’ biggest fan, but at least he has spotted the potential of Luiz in the midfield, as a playmaker rather than a destructor. I thought that Wigan caused us a few problems in the first-half, with old boy Franco di Santo involved. When he came to retrieve a ball from behind the goal line, the MHL gave him a nice reception and he clapped us back; nice to see. A fine Petr Cech save from Shaun Maloney brought us all to our feet. A through ball from David Luiz, fresh from his captaincy of the Brazilian national team on Wednesday, found Fernando Torres who ably pushed the ball into the path of an advancing Ramires. He thumped the ball past Al Habsi and we could relax a little. A couple of efforts from Fernando Torres – another Cons favourite – promised good things. As the first-half drew on, our dominance increased. A few efforts from fizzed close to the Wigan goal but there was no further addition to the score line. I had already warned Cons of the lack of atmosphere at games these days, but she didn’t seem fazed. Frank Leboeuf was on the pitch at the break. He hasn’t put on an ounce of fat since he hung up his boots. Soon into the second half, a rampaging Azpilicueta sent over a great ball which easily found Eden Hazard, unmarked. The finish was cool and clinical. 2-0 and coasting. Within two minutes, we conceded. A hopeful punt into space seemed to befuddle Cahill and Ivanovic. Maloney ran on to the ball, rounded Cech and adroitly slotted home from an angle. The crowd were slowly getting into the game. A Lampard shot whizzed past the post. Ramires chased down a defender right down in front of us – it was a great piece if aggressive play – and this single action galvanised the support. Of course, in my mind, this is completely the opposite of what should happen at Chelsea. Our loud and partisan support should galvanise the team. The two highlights of the second-half were two perfectly played passes from Lampard, with perfect weight, direction and “fade.” However, Wigan threatened again, causing Benitez to change the personnel. Juan Mata replaced the impressive Oscar. He was soon involved. A Hazard pass found Mata. He played the ball back towards Lampard, who took aim and slotted the ball low past Al Habsi. With great pleasure, I photographed the goal – number 198 – and the resultant celebratory leap, before Frank returned back to thank Mata for the perfect pass. The crowd found its voice towards the end of the game and Cons was joining in. Some more changes. Benayoun for Cahill, Luiz back into defence. Marin for Hazard. Another rampaging run from Azpilicueta took him in to a central position. He fired in a dipping shot, which the Wigan ‘keeper could only parry. The ball flew out to Marko Marin who flung himself at the ball. He appeared to head it – like a youngster, unsure of the best way – with eyes shut and head down, the ball thumping against the top of his head. In truth, he did well to contort his neck to meet the ball in the first place. I snapped away as he celebrated amongst a few exultant fans in the MHL. In truth, the score line flattered us. There were no anti-Benitez chants throughout the game, which I regard as a positive. All things considered, a good – albeit quiet – day at the office. After the game, Cons joined me for the first Supporters Trust meeting in the Fulham CIU club, just a few yards down from the old So Bar. I was happy that she was able to witness a key moment in the history of our club. Although the meeting was rather chaotic, a few key statements were announced and there was a good vibe in the crowded bar. I would heartily recommend that any Chelsea supporter – in the UK, in the USA, in Thailand, in Indonesia – join up. It only costs £5. Outside, Cons and I said our goodbyes, but with a promise that we’d do it all again soon. I walked back to the car, past a busy Goose, and set off for the return home. A strange thing happened, however, at Fleet Services. As I sat inside the services, eating a brie, lettuce and grape sandwich, refuelling myself for the next hour’s drive, I suddenly had a moment of concern. A moment of clarity. It was 8pm on a Saturday night. I was all by myself. I was at a service station in Hampshire. It was a cold night outside. What on Earth was I doing? Without Parky – or Glenn – or any of the friends who used to travel up from Frome for home games – the return drive back to Somerset appeared to be a rather sad journey. I sighed. I haven’t felt like that for years and years. I then smiled. The rest of the drive home was uneventful, save for some foggy weather as I tentatively made my way past Stonehenge. This slowed my progress, but on this particular occasion, after the events of the past week, I was more than happy to take it easy. I peered in to “The Cornerhouse” pub as I made my way through Frome and imagined conversations taking place. That moment of concern which I had encountered at Fleet services an hour or so before, was put into perspective. The home run had begun again. This entry was posted in Season 2012-2013. and tagged 2012-2013, Asia, Chelsea Supporters Trust, David Luiz, Frank Leboeuf, New York Blues, Peter Bonetti, Ron Harris, Summer Tour by Chris Axon. Bookmark the permalink.